Jonathan and Amanda, the founders of Comhrá le Chéile, are a married couple who met in 2003, in a pub... which is ironic because neither of them drinks! 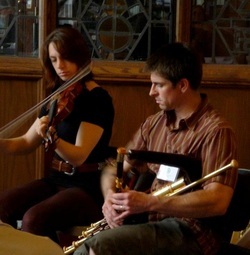 They were both there for the traditional Irish music session (they are both musicians), and throughout their years together, they have shared a love of Irish music and language. In 2012, they both attended the National University of Ireland, Galway for a Master's degree in Modern Irish. Together, they wish to continue to improve their own Irish skills and to give back support and resources to the community in the States, in Ireland, and around the world who have given them support to realize their dream. You are welcome to contact us via email at comhralecheile@gmail.com.